As Pope Benedict XVI departed Vatican City by helicopter on February 28, 2013, the last day of his pontificate, Cardinal Timothy Dolan was standing with the other cardinals from the United States on the roof of the North American College to see him off. The Cardinal Archbishop of New York, however, begins his account of the conclave two weeks earlier. The mere announcement that the frail German pope was resigning already disrupted Dolan’s calendar, because a few hours after he learned of it he appeared on a live television talk show to explain what it all meant. Upon arriving in Rome, the author did not immediately reside in the Casa Santa Marta (the cardinals’ high-security “hotel” during conclaves) but rather in the North American College, where he had spent four years as a seminarian and seven as rector. He compares the days before the official election process, when the See of Peter was vacant, to the time the Apostles spent in the upper room between the Ascension and the first Pentecost. When most of the cardinals from around the world had gathered in Rome, the General Congregations began. Their collegial prayer was “the cornerstone”: daily Mass and the Divine Office, visits to the Blessed Sacrament and the prayer “Come, Holy Spirit” at the start of official business. 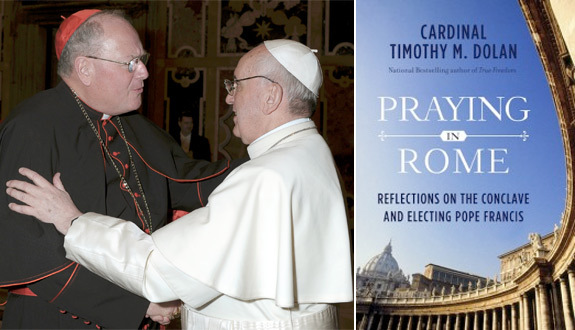 The author remarks that the cardinals shared with one another their faith and their “pastoral urgencies”, but while talking and getting acquainted they also “let off steam about some of the criticisms we held towards the Vatican”. The author includes a nice vignette about meeting the future Pope Francis during the General Congregations and addresses the ex post facto theories about “Why Jorge Mario Bergoglio?” “We were not so much looking for particular characteristics, but instead we were looking at the man.” Besides the many striking “unscripted” gestures of the new pope that have been widely publicized, Cdl. Dolan mentions a few other quietly considerate acts: on the evening of his election Pope Francis interrupted his greetings with the individual cardinals so as to speak to the crowds on St. Peter’s Square, who were patiently waiting in the rain. Cdl. Dolan’s e-book contains quite a bit of humor, some of it jokey (ribbing the boyish-looking Cardinal from the Philippines), much of it wise. (Will the beloved “Pope of Change” modify Church teaching about morality? “Fughetabboutit!”). While taking his oath of confidentiality quite seriously, the author still manages to humanize the hallowed procedures of a papal conclave. He disarms the commentators who try to pit Pope Francis against his predecessor by demonstrating that every pope has his signature style. In short, he retrieves the events of Lent 2013 in the Year of Faith from the opinion pages and the blogosphere and brings them back into the life of the Church.